This past month, Plan and Save the Children Sweden have collaborated to produce a second edition of this guide on how civil society organisations can best engage with the African Committee of Experts on the Rights and Welfare of the Children (ACRWC). This guide has been developed in collaboration with African civil society organisations, academics and members of the Committee. .
Africa is the only continent with a region-specific child rights instrument. The ACRWC, adopted in 1990 by the Organisation of African Unity (disbanded 2002), is an important tool for African child rights activists as it complements the UN Convention on the Rights of the Child. Though much progress has been made to promote the ACRWC, still more needs to be done to make this important human rights treaty accessible for civil society and state institutions in Africa. This guide aims to be a resource for civil society organisations who are interested in finding out more about the ACRWC and the Committee. The publication highlights methods on data collection, documenting information, and the use of official parliamentary/legislative records. 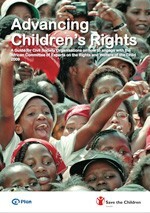 It contains practical advice and information on how civil society can engage with the Committee to advance children’s rights in Africa. This edition reflects important developments relating to the Committee’s work, civil society organisations’ engagement with the Committee and the functioning of the CSO Forum on the ACRWC (note the special mention of the CSO Forum database). The publication of the French version of the Guide is scheduled for May 2011. An Arabic version is also foreseen. The HURIDOCS Resource Library is a carefully curated collection of tools and manuals for human rights monitoring, documentation and communication, produced by HURIDOCS and many other organisations. It contains more than 200 manuals, articles, organisations, websites etc., divided into five main categories: Managing Documentation, Monitoring and Documentation, Search and Analysis, Specific Areas, and Websites and Information Sharing. Last fall, Benetech was featured here for its role in the convictions of two former Guatemalan police charged with human rights violations in the 1980s. Patrick Ball, VP of the Benetech Human Rights Data Analysis Group (HRDAG) human rights monitoring, gave a talk to the Open Society Foundations last month as part of the foundation’s Information Program. Human rights monitoring consists primarily of receiving information from witnesses and conducting investigations. The resulting information is often stored in databases. However, the statistics generated from databases collected in this way may tell us more about the functioning of the organization doing the monitoring than about the violence being monitored.